A new study offers a clear-eyed warning about the ramifications of an Asian carp invasion into the Great Lakes. Bighead carp are one of two invasive species that are the focus of a new study analyzing how the carp would affect other fish species if they reached Lake Erie. The study predicts that 1 out of every 3 pounds of fish in Lake Erie could eventually become Asian carp. Asian carp, a voracious invader charging upstream through the Mississippi River Basin, would dramatically change the dynamics of recreational and commercial fisheries in Lake Erie if they make it into the smallest of the Great Lakes, according to a new study. Scientists predict the carp could eventually account for one-third of the fish in Lake Erie by weight. The study focuses on two species of Asian carp, bighead and silver, that have been proliferating throughout the Mississippi River Basin for more than four decades. Native to Eurasia, the carp were originally brought to the southern United States to clean fish farms, but escaped during floods. Silver and bighead carp eat plankton, the microscopic plants and animals that make up the base of the food web in lakes and rivers. This makes them especially destructive to native fish that also depend on plankton for food, and they have become so abundant in certain areas of the Mississippi and Illinois rivers that other fish species struggle to survive there. Millions of dollars in federal and state money have been spent on efforts to keep the carp from reaching the Great Lakes, where a $US 7 billion annual sport fishing industry is at stake. Officials say that the carp are stopped 88 kilometers (55 miles) from Lake Michigan in the Illinois River, about 29 kilometers (18 miles) from electric dispersal barriers designed to deter their progress. However, there is evidence, based on DNA samples, that at least some fish have traveled much closer to the lake through the Chicago Area Waterway System (CAWS), a 161-kilometer (100-mile) network of four rivers and two canals that connect Lake Michigan with tributaries of the Mississippi River. The presence of a few individual carp is not a major concern since it is highly unlikely that they will reproduce in such low numbers, according to researchers. But if enough carp get into Lake Erie, previous scientific studies found that they would have plenty of food and suitable places to reproduce to establish a self-sustaining population. The new study, led by researchers at the University of Michigan and the Great Lakes Environmental Research Laboratory (GLERL) in Ann Arbor, goes one step further. Using computer models and input from Asian carp experts, it is the first study to forecast and quantify how an established Asian carp population would affect other fish species in Lake Erie. The lake is the most productive of the Great Lakes, and its abundance of walleye, perch, trout, and bass supports lucrative sport fishing and commercial fishing industries in both Canada and the United States. 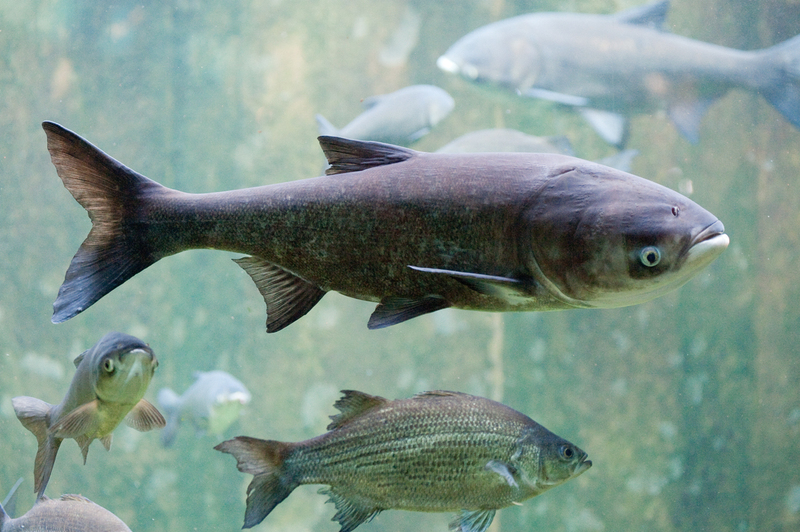 In the event of an Asian carp invasion, the study found that the prognosis for these fisheries is concerning, but the worst-case scenario –a complete fishery collapse—is unlikely. State and federal agencies conduct commercial fishing exercises to control invasive Asian carp populations downstream of barriers near Chicago meant to deter their progress toward the Great Lakes. “Asian carp will very likely become really abundant,” Edward Rutherford, a research fishery biologist at GLERL and one of the study’s authors, told Circle of Blue. The model used in the study projected results over a 120-year time frame and predicted that it would take two decades for Asian carp to establish a stable population in Lake Erie following the initial invasion. Stretches of the Mississippi and Illinois rivers have become so infested with invasive Asian carp that dozens of wildly leaping fish erupt into the air whenever a boat passes. The high-flying act is a hallmark of silver carp, which can grow as large as 1 meter (3.2 feet) and weigh 27 kilograms (60 pounds). The jumping poses a danger to boaters. Models used in the study predict, however, that the carp will not become as successful and abundant in Lake Erie as they are in the Mississippi and the Illinois. “We found that the main reason behind this difference—one is the Mississippi River has high nutrient loads and high productivity, while the other thing is that the potential for predators for Asian carp in Lake Erie is much higher than in the Mississippi River,” Hongyan Zhang, an assistant research scientist at the University of Michigan’s Cooperative Institute for Limnology and Ecosystems Research and the study’s lead author, told Circle of Blue. In other words, Asian carp will find less to eat in Lake Erie than in the Mississippi River, and more fish that will eat them. The new study breaks ground in several ways. It is the first to use a food web model, basically a map of who eats who, to look at the effect Asian carp could have on the Lake Erie ecosystem, and its results will eventually feed into an economic model to estimate the economic costs and benefits of keeping Asian carp out of the Great Lakes Basin. It incorporates information from Asian carp experts to assess how Asian carp would behave—what fish they would eat, what fish would eat them, and how much they might reproduce in Lake Erie—and also includes estimates of how likely each of those behaviors would be. Significant uncertainties about the assumptions fed into the model still exist. Namely, researchers don’t know for sure what Asian carp might use for food in Lake Erie, where conditions are different from those in the North American rivers they have already invaded. Lake Erie is the smallest and most productive of the Great Lakes. 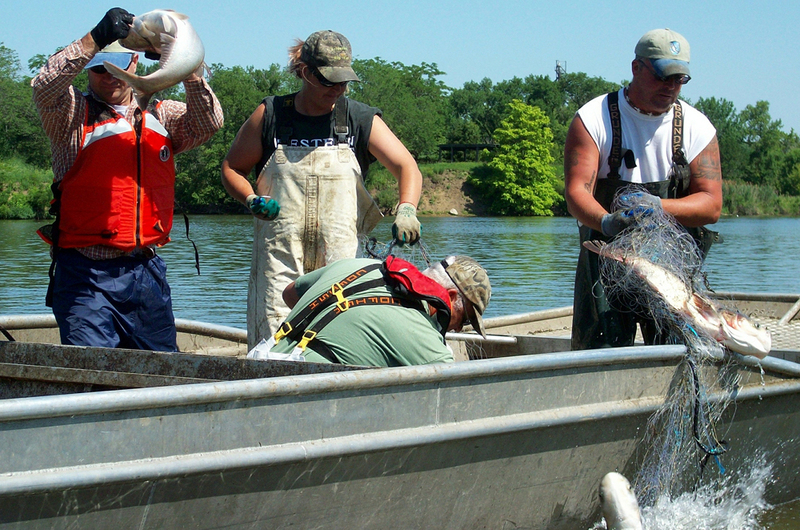 Its valuable commercial and recreational fisheries would be at risk if Asian carp invade. Another question, according to Lodge, is where Asian carp would choose to reproduce in the Lake Erie Basin. The model assumes that they could reproduce in both tributaries of the lake and the lake itself. The fish might choose one or the other. Certain variables were beyond the scope of the model and not considered in the study. For example, the effect jumping Asian carp might have on recreation in Lake Erie, or potential changes to water temperature due to climate change. These areas are ripe for further research. Lodge added that it is also important to keep in mind that bighead and silver carp are not the only invasive species that threaten to travel between the Mississippi River Basin and the Great Lakes, or vice versa. More than 200 non-native fish, plants, parasites, pathogens, and invertebrates have been introduced to either the Great Lakes or Mississippi River Basin. There is a significant risk that thirteen of those could transfer between the two basins and become invasive, according to 2014 study by the U.S. Army Corps of Engineers that looked at possible ways to hydrologically separate the Mississippi from the Great Lakes.